Dubai, UAE; February 23, 2010: Burj Khalifa, the world’s tallest building developed by Emaar Properties, is readying to welcome its first residents with the orientation programme for home-owners of Armani Residences, located on levels 9 to 16 of the tower, currently ongoing. A mixed-use tower featuring the world’s first Armani Hotel Dubai and Armani Residences, alongside corporate suites, residences, retail and leisure facilities, Burj Khalifa is at the centre of Downtown Dubai, a 500-acre mega-development by Emaar Properties. 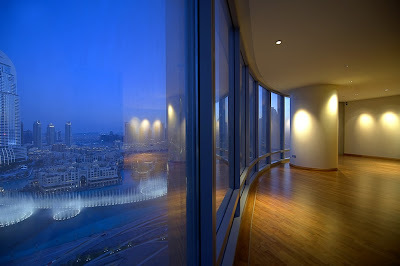 Among an array of lifestyle amenities, the tower has a public observation deck - At the Top - on level 124. Described as the new heart of Dubai, Downtown Dubai encompasses The Dubai Mall, one of the world’s largest shopping and entertainment destinations; several hotels; offices and homes. A stellar attraction within the community is The Dubai Fountain, the world’s tallest performing fountain. At 828 metres (2,716.5 ft) high, Burj Khalifa is the world's tallest structure surpassing the KVLY-TV mast (628.8 metres; 2,063 ft) in North Dakota, USA. The tower is taller than Taipei 101 in Taiwan, which at 508 metres (1,667 ft) has held the tallest-building-in-the-world title since it opened in 2004. 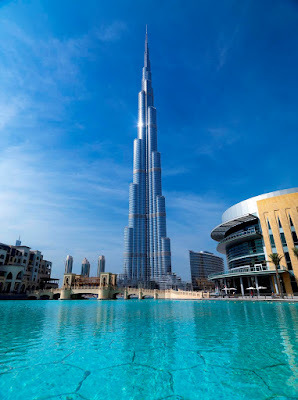 Burj Khalifa also surpassed the 31-year-old record of CN Tower, which at 553.33 metres (1,815.5 ft) has been the world’s tallest free-standing structure on land since 1976. Emaar has inaugurated Burj Khalifa, the world's tallest building and free-standing structure, and has opened The Dubai Mall, the world’s largest shopping and entertainment destination. In Saudi Arabia, Emaar is developing King Abdullah Economic City, the region's largest private sector-led project in Saudi Arabia, featuring a Sea Port, Central Business District, Industrial Zone, Educational Zone, Residential Communities and Resort District. Dubai, UAE; February 11, 2010: Highlighting its global footprint with the recent inauguration of Burj Khalifa, the world’s tallest building, Emaar Properties PJSC announced today its financial results for the 12 months ended December 31, 2009. Annual net operating profits for the period reached AED 2.324 billion (US$ 633 million), as compared to the restated net operating profits of AED 4.236 billion (US$ 1.153 billion) in 2008. Annual revenue for 2009 was AED 8.413 billion (US$ 2.290 billion) as compared to the restated revenue of AED 10.717 billion (US$ 2.918 billion) in 2008. The restatement of the 2008 profit and revenue relates to change in accounting method from percentage completion to completed contract method of revenue recognition in accordance with International Financial Reporting standards (IFRS). Fourth-quarter 2009 net operating profits stood at AED 923 million (US$ 251 million), 41 per cent higher than the third-quarter net operating profit of AED 655 million (US$ 178 million) and 149 per cent higher than the fourth quarter 2008 net operating profit of AED 370 million (US$ 101 million). Revenues for the last three months of 2009 reached AED 2.984 billion (US$ 812 million), 53 per cent higher than third-quarter 2009 revenue of AED 1.948 billion (nearly US$ 530 million) and 94 per cent higher than the fourth quarter 2008 revenue of AED 1.535 billion (US$ 418 million). Emaar has delivered approximately 3,100 units during 2009 as compared to 4,900 units in 2008. However, the revenues by Malls and Hospitality businesses increased significantly. The company implemented a number of customer oriented policies, which assisted in maintaining its Gross Profit Margins at 2008 levels. These policies also enabled customers to settle their obligations towards properties delivered, which is also positively reflected in the revenues of the Company. 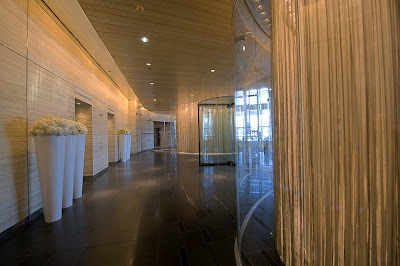 In spite of opening two hotels during the year – The Address Dubai Mall and The Address Dubai Marina, the selling, general and administration expenses in 2009 were maintained at 2008 levels through implementation of appropriate cost control mechanisms. Although, the profitability levels were maintained for the core businesses of Emaar, the net operating profit decreased due to provisions made by the Company’s associated companies in the Financial Sector, Amlak Finance and Dubai Bank towards their loans and advances portfolio. The Company also recorded lower fee income on property transfers due to discontinuance of such charges and lower net interest income due to utilization of cash resources to complete investment assets (Malls and Hospitality) during the year. The robust performance for the Company during 2009 - a challenging year internationally - is a result of concerted effort by the Company to optimize resource use. Emaar also worked closely with all stakeholders to make the Company resilient and deliver results. Emaar’s Hospitality and Mall subsidiaries were significant contributors to the company’s revenue stream, with the year witnessing the opening of two new hotels and the grand inauguration of The Dubai Mall, the world’s largest shopping centre, which attracted more than 37 million visitors in its first year of operation. Emaar Healthcare Group, the company’s healthcare subsidiary, opened its first world-class medical centre in Dubai late last year. Overseas, Emaar projects in India, Egypt and Saudi Arabia, all reached advanced stages of completion and will be ready for handover this year. Mr. Mohamed Alabbar, Chairman, Emaar Properties, said the company focused on the timely completion of existing projects across global markets through stronger resource optimization. “The crowning achievement in our track record of successful project management and delivery is the inauguration of Burj Khalifa. From delivering the world’s tallest building to the world’s largest shopping centre, and further strengthening our ability to build world-class communities such as Downtown Dubai, we have proved our commitment to delivery,” explained Mr. Alabbar. Highlighting the success of Emaar’s diversified growth model, the company’s subsidiaries in hospitality & leisure and shopping malls & retail contributed to developing self-contained lifestyle communities in Dubai, which is also being rolled out in international markets. “During an especially challenging period for economies across the globe, Emaar contributed to the socioeconomic growth and stability of Dubai by creating more than 12,500 new jobs through our subsidiaries. Domestic growth, catalysed by Burj Khalifa, will be the highlight of this year, as Emaar continues to focus on maximising long-term value for our shareholders,” said Mr. Alabbar. This year, Emaar will also focus on middle income housing as a strategic growth area to meet the growing demand for homes in emerging markets. According to recent estimates, demand for residential property in India will be over 7.5 million units by 2013 of which 85 per cent is projected in the mid and affordable housing segment – a trend observed in Egypt, Pakistan and other emerging markets too. Emaar Properties made global headlines with the inauguration of Burj Khalifa, which at 828 metres (2,716.5 ft), is the world’s tallest building and manmade structure. At 200 storeys, including 160 habitable levels, Burj Khalifa anchors the 500-acre Downtown Dubai mega-development, which also features The Dubai Mall. The Dubai Mall has 1,200 retail outlets, including a range of flagship stores and global brands represented nowhere else in the Middle East. At the mall’s entertainment precinct, Emaar has introduced the region’s first SEGA Republic, an indoor theme park developed in partnership with SEGA Corporation; and Dubai’s largest megaplex, the 22-screen Reel Cinemas. Emaar has also opened KidZania®, the region’s first-of-its-kind children’s edutainment centre. In 2009, Emaar also unveiled The Dubai Fountain, the world’s tallest performing fountain, which attracts thousands of visitors every day. Highlighting Emaar’s successful business segmentation strategy, in 2009 the company opened two new hotels in Dubai under The Address Hotels + Resorts brand. The Address Dubai Mall and The Address Dubai Marina increased the portfolio of Emaar’s own hotel brand to five, including The Address Downtown Dubai, The Palace - The Old Town, and The Address Montgomerie Dubai. Emaar Hospitality Group made its successful foray internationally in 2009 with management contracts signed in France and Morocco. In Dubai, the hospitality & leisure subsidiary of Emaar also opened the Dubai Marina Yacht Club, revamped the Dubai Polo & Equestrian Club and strengthened Arabian Ranches Golf Club. The performance of Emaar Hospitality Group was honoured globally with the company clinching the Arabian Business award for Hospitality Company of the Year 2008; World Travel Award’s Dubai’s Leading Lifestyle Hotel 2009, Middle East’s Leading New Hotel 2009; AHIC’S Best New Hotel 2009 for The Address Downtown Dubai; and Dubai’s leading City Resort for The Palace – The Old Town at the World Travel Awards. In India, one of the company’s key growth markets, Emaar MGF Land Limited, the company’s joint venture in that country, has filed its Draft Red Herring Prospectus with the Securities and Exchange Board of India to enter the capital market with an initial public offering of AED 2.938 billion (INR38,500 million; US$830 million). Emaar MGF Land Limited is also on course with the completion of the Commonwealth Games Village 2010, a residential complex set in 27.7 acres in Delhi with an estimated saleable area of 1.8 million sq feet. Emaar has made considerable progress with its master-planned communities in India, Syria, Morocco, Jordan, Saudi Arabia and Egypt, with several hundred homes to be handed over this year. With Tuscan Valley Houses in Turkey and Mirador Villas in Canyon Views in Pakistan, Emaar has already handed over its pioneering master-planned communities overseas – a trend that complements the company’s delivery track-record in Dubai.